Montgomery concluded her SIUE tenure of 30 years of coaching and administrative duties in October 2018. In that time, her accomplishments include more than 1,000 career wins, winning the 2007 NCAA Division II National Championship, 12 NCAA Tournament appearances, six conference titles and 10 40+ win seasons. In SIUE softball's first season in Division I (2009), Montgomery led the Cougars to a 40-10 record. During the 2014 season, the Montgomery led Cougars were crowned Ohio Valley Conference Tournament champions, earning an automatic bid to the NCAA Division I Championships. 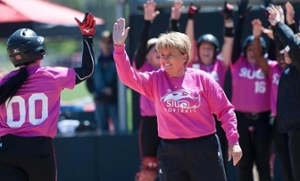 Montgomery ended her illustrious SIUE softball coaching career with a 1,051-540-2 (.660) record, making her one of the most successful NCAA softball coaches of all time. At SIUE, she coached 11 All-Americans and 79 All-Conference players. She came to SIUE in 1981 as a softball student-athlete. Montgomery was inducted into the SIUE Athletics Hall of Fame as a player after setting many school pitching records. She has since had many of the records broken by players who she coached, but Montgomery still holds the record the lowest earned run average in a career (0.85) and shutouts (42). Other inductees into the St. Louis Sports Hall of Fame Metro East Class of 2019 alongside Montgomery include Brian Cox (NFL), LaPhonso Ellis (NBA), Dawn Harper (Olympics), Jeff Luechtefeld (basketball), Fred Rakers (volleyball), Mike Reis (broadcaster), Bob Smith (international baseball) and Eric Wright (NFL). The 2019 St. Louis Sports Hall of Fame Illinois Enshrinement Dinner will take place Monday, Feb. 11 at the Gateway Classic Cars venue in O’Fallon, Illinois. Tickets may be purchased by calling 618-558-4861 or online at stlshof.com.